Trackside Travels: Random Ramblings - Here Comes Thomas! There was nothing quite like the glory days of Michigan steam in the 21st century -- yes, the 21st century -- when two Berkshire locomotives from the Lima Locomotive Works were stomping through the state. From 2007-2009, Michigan's own Berkshire, Pere Marquette No. 1225 based out of Owosso, would be joined on and off by Nickel Plate Road No. 765, visiting from Fort Wayne, Ind. Photo charters by both Lerro Productions and Historic Transport Preservation, plus Train Festival 2009, all made Michigan a grand place for steam. Nickel Plate Road 765; Carland, Mich. 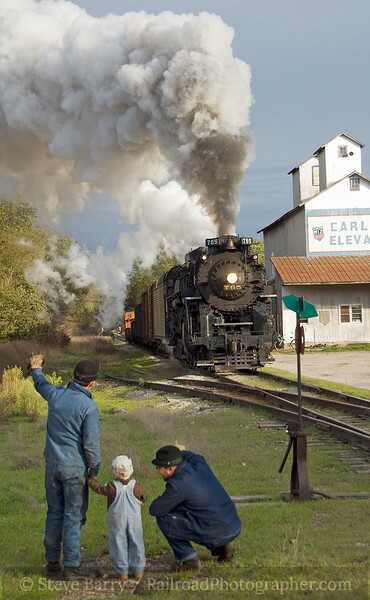 The grain elevator at Carland made for a favorite photo prop on many charters, and not unexpectedly we were once again at Carland on October 10, 2009, for a charter sponsored by Historic Transport Preservation with the 765. While there, a mother and her young son happened to pull up to watch the runbys. The kid was obviously a budding railfan, decked out in complete Thomas the Tank Engine garb. Well, we just had to get the kid into a photo. Mom was dressed in 21st century clothing, but we asked her if her son would mind posing with two of our "actors" during a photo runby. She said it wouldn't be a problem, so Kelly Lynch of the Fort Wayne Railroad Historical Society took the lad by the hand and posed him in front of the photo line. Christopher Pitzen knelt down next to the kid. Now 765 is a loud locomotive, especially during photo runbys when smoke and noise are a part of the show. With a grade crossing just behind the photo line (and the need for 765 to whistle loud for the crossing) I was positive the kid would bolt for his mom halfway through the runby. Christopher, however, pointed down the track and kept telling the kid "Here comes Thomas! Here comes Thomas!" The noise was incredible, the ground shook -- and the kid held his ground. As the locomotive blasted (and "blasted" doesn't begin to convey the experience) past, the kid turned his head and followed the engine with his eyes, smiling a huge smile. That's an experience that will stick with you for a long, long time.